Looking for a way to keep cool on Denman Street this summer? Make your way over to Styo Dessert (907 Denman Street) for some of the West End’s coolest treats. Since their launch in September of 2014, owners Dorothy Tam and Kenneth Lam have been hard at work perfecting their homemade frozen yogurt made with fresh, natural ingredients. Dorothy and Kenneth named the business “Styo” with stylish desserts in mind. And you don’t need to be in their shop long to see why! They have delicious frozen yogurt parfaits, blended smoothies, homemade popsicles (the “detox veggie” popsicle is fantastic), and sumptuous fresh made stuffed waffles available in sweet and savoury. Just in time for Canada Day, Dorothy and Kenneth plan to introduce soft serve ice cream to their menu based on a recipe that they’ve been perfecting over the past couple weeks! Be sure to stop by over the long weekend and try it out. Styo Dessert can also do pre-orders for weddings, birthdays, and parties. Keep them in mind for all your party needs. 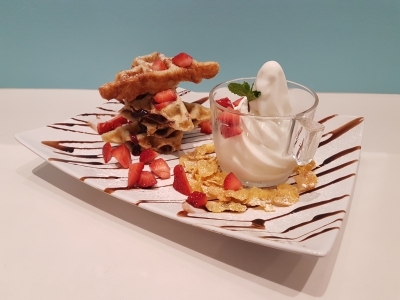 Next time you’re on Denman Street and need to cool off, why not give Styo Dessert a visit? We bet they’ll have what you’re looking for!